Quick and easy Butternut Squash Pasta is rich and creamy without any butter or cream! 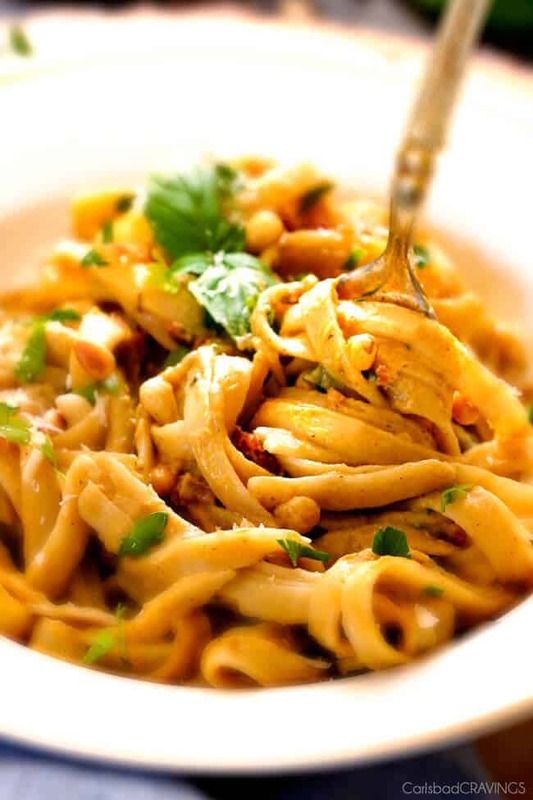 Creamy Butternut Squash Pasta is luxuriously silky, healthy and absolutely addicting! 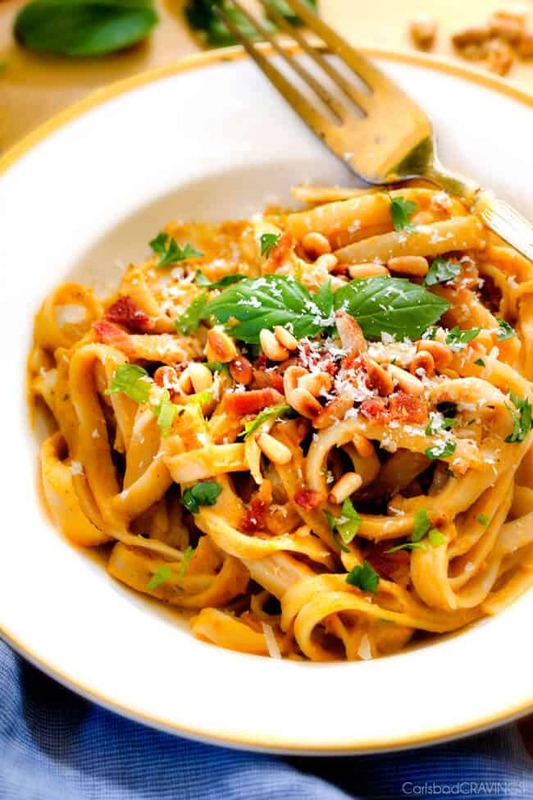 It is made with butternut squash, garlic, herbs, fresh Parmesan and topped with crispy bacon and toasted pine nuts. It is perfect in its simplicity or completely customizable with chicken, shrimp or veggies! To continue the celebration of the advent of Fall, I bring you creamilicious (yet cream-less), comforting Butternut Squash Pasta! I love the silkiness and sweet yet nutty flavor that pureed butternut squash adds to any recipe whether its soup, risotto, or pasta sauce. The sauce is naturally gluten free and just oh so rich and comforting while still being healthy! This Butternut Squash Pasta Sauce can be paired with your favorite pasta (thin spaghetti is my favorite) and even ravioli – you just won’t use all the sauce. Add shrimp, chicken, your favorite veggies or just slurp your butternut squash pasta in all its silky glory – either way you have a healthy Fall meal that can be on the table in less than 30 minutes! Is Butternut Squash Pasta Healthy? Yes! This creamy Butternut Squash Pasta recipe not only is low in calories, but it is packed with nutrients, thanks to butternut squash! Would you believe me if I told you that butternut squash is a fruit? Most people use it as a vegetable, so that’s where the misconception comes from, but it is actually a fruit! Whatever food group it falls under, the taste and health benefits of butternut squash are undeniable. It packs in nutrients like fiber, potassium, vitamins A & C as well as magnesium. Butternut squash is a winter squash belonging to the family known as Cucurbitaceae. Its species name is Cucurbita maxima or C. moschata. Both pumpkins and squash belong to the same Cucurbitaceae family. You won’t be surprised when you cut open your squash and see the similarities between these fruits. Yes, that means pumpkin is a Fall fruit too! Who knew you were making tantalizing pasta sauce – with fruit?! Butternut Squash: the only real prep work for this Butternut Squash Pasta Sauce is peeling and chopping the squash. If you aren’t comfortable chopping your squash, I’ve detailed how to do it below or you can use pre-chopped butternut squash. Packages of pre-cut squash come with larger pieces so just make sure you chop them into smaller, uniform pieces. Aromatics: Because this butternut squash pasta sauce is so creamy, we need to infuse it with plenty of aromatics and seasonings so its not just bland creaminess but seasoned creaminess. The flavor starts with sauteed onions and minced garlic. You can use powders if you prefer, about 1 teaspoon each garlic powder and onion powder. Seasonings: in addition to onion and garlic, this Butternut Squash Pasta Sauce gets seasoned with chicken bouillon, red pepper flakes, dried basil, dried parsley, dried thyme, ground cumin, salt and pepper. You can add more or less of any of the seasonings to suite your tastes. Garnish: I like to top my Butternut Squash Pasta with crispy, salty bacon, nutty toasted pine nuts and freshly grated Parmesan cheese. Crispy sage and fresh basil wold also be delicious! HOW DO I CHOOSE A GOOD BUTTERNUT SQUASH? Look for a squash that feels heavier than its size. Find a squash with skin that has a matte finish. If the skin looks shiny, it was picked early and is not ripe. Touch the stem. It should look and feel dry where it was separated from the vine. Check for blemishes like cuts or dark spots. You don’t want any of those on your squash. HOW DO YOU CUT BUTTERNUT SQUASH? Remove the stem: You can do this simply by tapping it on your counter or cutting board, and it will pop right off! Peel it: Not all skins are created equal! Butternut squash skin can be quite difficult to peel. You need a sharp peeler. If you don’t have a sharp peeler in your kitchen, you can microwave the squash for about 2-3 minutes to aid in the peeling process. Don’t microwave it any longer though or it could explode! Use a fork to poke several holes in the squash, like you would a potato. Lay the squash on its side in the microwave. Let cool for about 2 minutes or until cool enough to handle. Cut a small slice off the bottom of your squash to give a flat, sturdy end. Place your squash on the cutting board on the flat end. Peel straight down from the top, neck, of the squash. This squash will first reveal white and then green layers as you peel. Peel away all color layers until only orange flesh remains. Place the peeled squash on its side on your cutting board and cut it into 2 pieces right where the neck meets the bulb. Place the flat surface of the neck on the cutting board and cut straight down until you have two halves. Place the flat end of the bulb on your cutting board and cut straight down until you have two halves. You should now have four pieces total. To scoop with a spoon, use a spoon with a serrated edge- like a grapefruit spoon and scoop out the seeds and the fibrous strings. To remove seeds with a knife, lie your bulb half flat side down on the cutting board. Make approximately one-inch slices across the width of the squash like you would a tomato or a cantaloupe. Then use a knife to cut out the seeds from each individual slice, like you would do with a paring knife to remove the skin of an apple. Lay your neck halves flat side down on your cutting board and slice length wise. Lastly, cube all your slices and you’re done! First, sauté chopped onions for a few minutes then add the squash and saute an additional 4 minutes or so, then add your garlic, red pepper flakes, chicken bouillon, ground cumin, basil, parsley, thyme, salt and pepper. Now we are talking. Add some water and simmer until the squash becomes fork tender, about about 8-12 minutes. Add your simmered seasoned squash to your blender (or use on immersion blender) and blend until smooth. Stir in some freshly grated Parmesan until nice and smooth and garnish with bacon, toasted pine nuts and more Parmesan cheese. Thank you Fall. Fork Tender: take care to simmer you butternut squash until it is fork tender – it is better for it to be overcooked than under cooked to achieve the creamiest pasta sauce. Use your Blender! : you have the option of using an immersion blender or your blender to blend the butternuts quash once it is fork tender, but I HIGHLY prefer my blender. It purees the squash to a luscious creamy texture superior to an immersion blender. 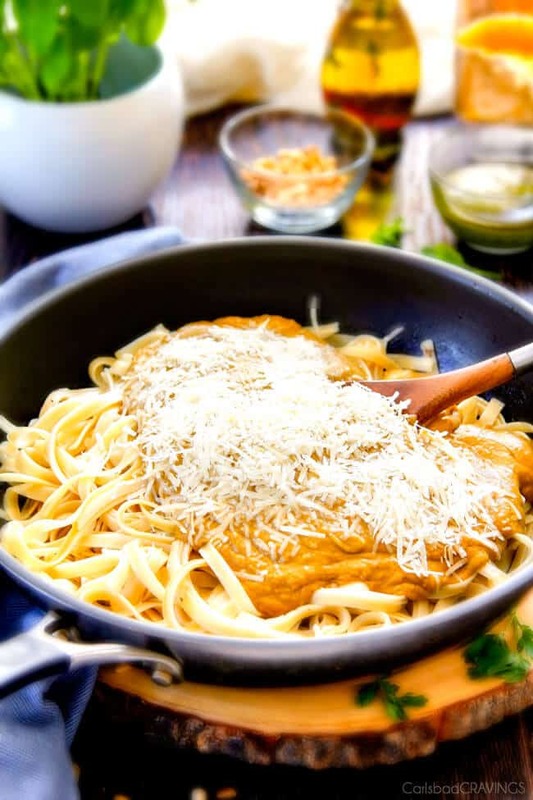 Let steam escape: whenever you puree something hot in your blender, like this butternut squash pasta sauce, you need to let the steam escape somewhere or else it will build up in your blender and then explode. I lift the corner of my lid and cover it with a paper towel. Scrape down sides. After you’e blended your butternut squash sauce, stop and scrape down the sides, then blend some more to make sure your sauce is completely smooth and there aren’t any stragglers. Poultry: You can add chopped chicken sauteed in some butter, salt and pepper or shredded rotisserie chicken, or ground turkey for a protein-packed pasta that is even more filling. Seafood: Add some shrimp sauteed in butter and garlic or buttery lobster or salmon. Other Proteins: this Butternut Squash Pasta would also be delicious with spicy Italian sausage, lean ground beef, or sliced turkey sausage. Crispy, salty bacon also pairs beautifully with butternut squash – and because bacon is always a good idea. Vegetables: You can add any veggies your heart desires! Simply saute them in some olive oil while your sauce is in the blender. Mushrooms, peas, cauliflower, zucchini, asparagus, spinach, would all be delicious. Pasta: You can serve this Butternut Squash Pasta Sauce with any pasta or NON pasta! Try zucchini noodles, spaghetti squash, rice, cauliflower rice or play around with different types of pasta shapes: cellentani, ravioli, orecchiette, penne, rigatoni, etc. Yes, you can! To save time when making your Butternut Squash Pasta, peel and cube your squash in advance and store it in the refrigerator in an airtight container for for up to 3 days. You can also chop your onions and mince your garlic and store them in separate airtight containers in the refrigerator. CAN I REFRIGERATE MY BUTTERNUT SQUASH SAUCE? Absolutely! To refrigerate your Butternut Squash Sauce – if you’re lucky enough to have ANY leftover – allow to come to room temperature, then pour and seal in an airtight container. Consume within three days. CAN I FREEZE MY SAUCE? Yes, you can freeze your Butternut Squash Sauce but not the pasta. If you know you are going to freeze the sauce, do NOT add the pasta, as the pasta will become mushy when frozen. To freeze, allow sauce to come to room temperature then seal, label and store in an airtight container for 4-5 months. Be sure to leave room at the top of your container for expansion in the freezer. HOW DO I REHEAT MY SAUCE? Pour the sauce into a saucepan and heat on the stove at medium-low until your sauce is heated through. Add water to thin according to desired consistency. Run hot water over your sauce container, rotating the container, to break up chunks of frozen sauce. Place sauce in a saucepan on a medium-low burner until sauce is heated through. LOOKING FOR MORE BUTTERNUT SQUASH RECIPES? 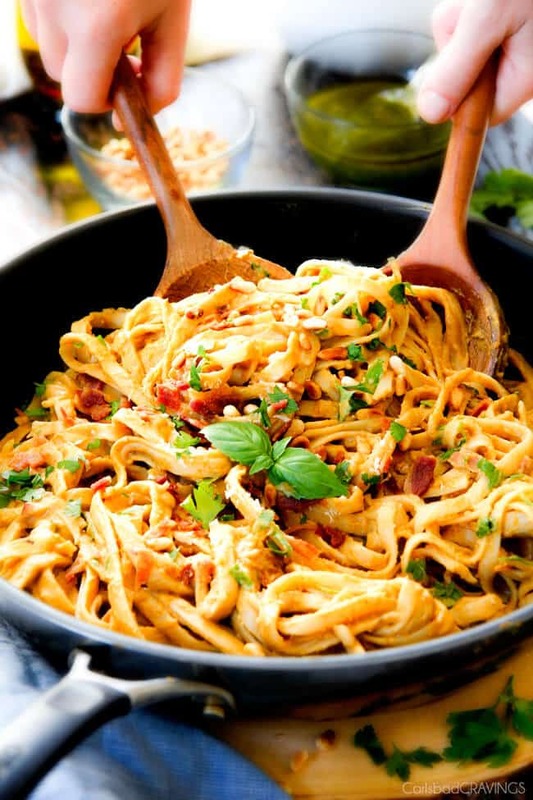 Want to try this Creamy Butternut Squash Pasta? Pin it to your PASTA, FALL or DINNER Board to SAVE for later! Quick and easy Butternut Squash Pasta is rich and creamy without any butter or cream! This Butternut Squash Pasta is luxuriously silky, healthy and absolutely addicting! 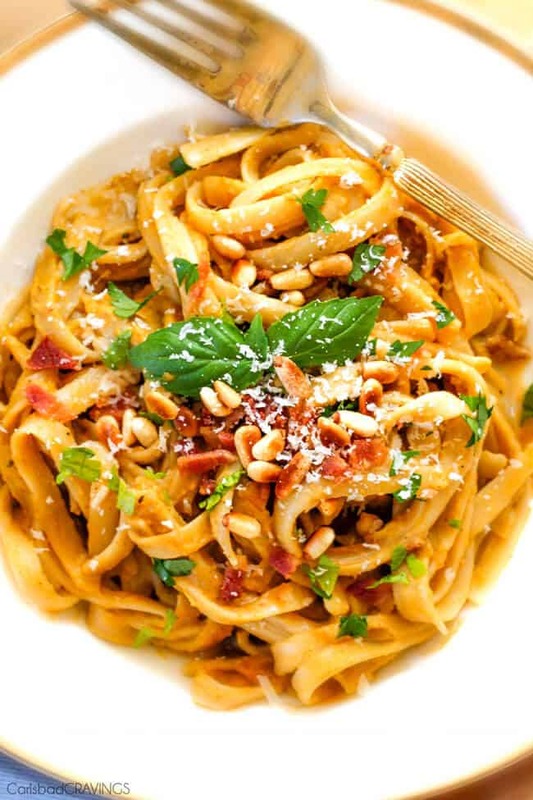 It is made with butternut squash, garlic, herbs, fresh Parmesan and topped with crispy bacon and toasted pine nuts. It is perfect in its simplicity or completely customizable with chicken, shrimp or veggies! Cook pasta al dente according to package directions. Remove one cup water then drain pasta. Heat olive oil over medium high heat. Add onions and sauté for 4 minutes. Add squash and sauté an additional 4 minutes. Add garlic and red pepper flakes and sauté 30 seconds. Add water, bouillon and all remaining seasonings/spices. Bring to a boil, cover and reduce to a simmer. Simmer until squash is fork tender, about 8-12 minutes. Add to blender (or use an immersion blender) and puree until smooth being careful to let some steam escape so the lid doesn’t explode (I cover a corner with a paper towel. Add butternut squash puree back to pan. Heat through then stir in 1/2 cup Parmesan until smooth. Add pasta and toss to coat, adding additional Reserved Pasta Water to reach desired consistency. Garnish with additional freshly grated Parmesan, bacon and toasted pine nuts. Hi Jen! I am always on the look out for butternut squash recipes as we grow them and they are our favorite squash! Adding all the flavor components you did, plus bacon 🙂 and pine nuts takes it to another level! I absolutely love bucatini so that is what I would use here. Hi Dorothy, so fun you can use squash from your own garden! I hope you love this recipe and can use your squash again and again! Hi Jen! I can’t wait to make this!! I love butternut squash! My mother-in-law grew butternut squash in her garden several years ago, and she said it was the best butternut squash. I should try growing butternut squash and make your past as often as I can! Thank you for sharing your recipes!! P.S. I am planning to make your “Slow Cooker Honey Baffalo Chicken Taquitos” tomorrow because everyone LOVES it! Can’t wait to try this with the butternut pumpkins I have growing in my garden. I have only today discovered your site, and can’t wait to try the many delicious recipes you have provided. Love the great pictures that go along with the steps. Thank you so much. I just read your story, and admire your positive outlook on life. You are a truly amazing lady. All the best for continued good health in the future. I just found your site! Lots of things I want to try! Making this tonight! Do you think the squash sauce can be frozen? 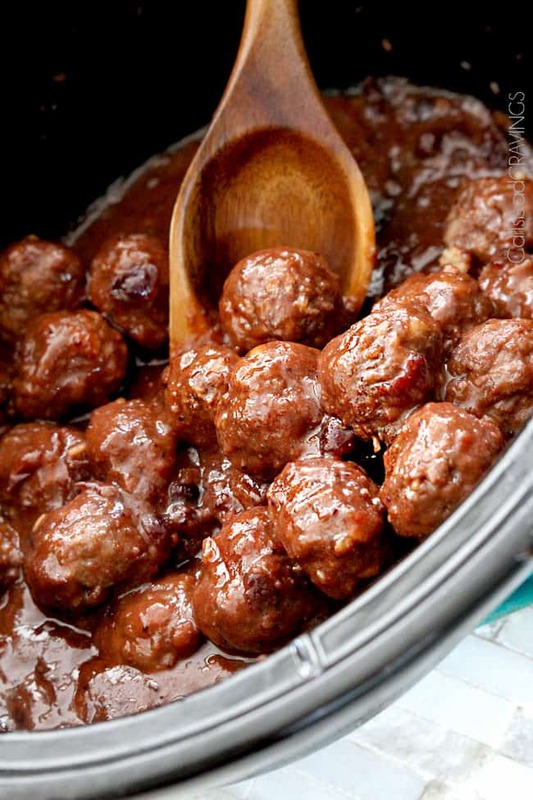 I would love to make a bunch and freeze for a quick weeknight meal. Thank you! Hi Lee Ann, welcome to my site! Yes, I think the squash sauce should freeze just fine. I hope you have fun exploring and trying lots of new recipes! Is the pound of pasta a wet or dry weight? Can the parmesan cheese be substituted for goats cheese? I can’t eat cow’s cheese, so it would be wonderful if this were the case. Hi Cat, Welcome to my site, I am so happy you stumbled upon it and are enjoying my recipes! and the “best chicken”- thank you for the ultimate compliment! The pound of pasta is dry – most pastas will say 1 lb or 16 oz on the package. As far as substitute goat cheese – I think it comes down to personal taste – if you like goat cheese, go for it but it would also be delicious without cheese as well. Hope this helps! I think you would really enjoy a lot of my slow cooker recipes as well. They are super easy and would be quick to prepare! HI Jen! 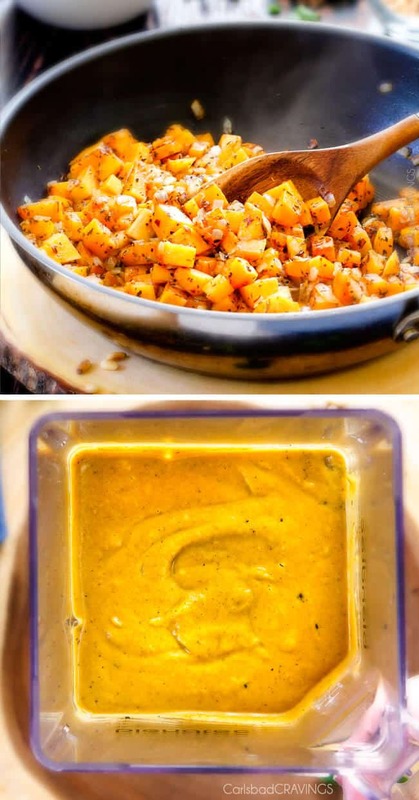 Just made FOUR batches of this SOOOO yummy butternut squash sauce!!!! I couldn’t stop eating the first batch straight from the pan. So I made 3 more to freeze! It is being added to our Freezer party menu. 🙂 Can’t wait to actually have it over pasta. Another Winner that will be a staple in our house! Wow Therese, that is so awesome you loved this sauce so much that you made 3 more batches to freeze – yay! Your Freezer Parties seriously are the coolest and no doubt SO helpful! Thanks for taking the time to comment – you always brighten my day!